Scripture clearly communicates that God highly values and uses the gifts and calling He has given to women. Genesis 1:27-28 illustrates that God created women in His image just as He did men. Women were also equally given the dominion mandate in the Garden of Eden; the woman was also to subdue and rule over the earth. Both men and women were created to be fruitful and productive. Not just productivity in terms of childbearing, but also in the maximizing of what they each can offer to the world. The woman also has a calling to rule. She does not have less intrinsic value than man. God created both man and woman in His image for the purpose of ruling on earth. Scriptures also clearly communicates that women are crucial in ministry to the family, church, and society. Women are to prioritize their ministry in the home and to her family. This ministry is important and should be valued, not neglected. Stated plainly, her family should come first. Each woman should view her family and her home as a ministry for which she has a God-given responsibility. Women are also to use their gifts in the church because women have abilities and callings that can benefit the body of the Christ. Women ought not be marginalized in the church. Her gifts are needed for the body of Christ to thrive. In addition to the home and the local church, women are to use their skills for the well-being of society. In the book of Judges, God used Deborah for the well-being of Israel; she is called the Mother of Israel (Jdg 5:7). Jael, another woman in the Bible, helped save Israel (Jdg 4:17-22). From the beginning, God is clear that it is through the seed of a woman that ministry to mankind would be carried (Gen 3:15). Women are critical for the purposes of Jesus Christ in the world. As it relates to leadership in the local church, God has a covenantal order under which men and women must function, and that order cannot be breached. This order does not reduce the significance of a woman, but it does mean that there is a chain of command that has to be followed in order to use both men and women the way He intends. Both men and women are to function within God’s ordained covenantal order, including in the area of leadership. Women can have leadership roles in the church. For example, 1 Timothy 3:8-13 tells us that a woman can be a deaconess in the church. The important scriptural principle for women’s leadership in the church is that it must be under legitimate male authority. In the local church women are to be valued, recognized, supported, and appreciated for their ministry within God’s covenantal order. They are not to be denigrated or reduced, but instead, celebrated and valued within God’s structure. Women can have any gift that is authorized under the authority of the final leadership of the church. It is clear in the Scriptures that a woman’s role was valuable, productive, and critical in the life of Christ. In Luke 8:1-3, we can see that Jesus had women walk alongside of Him and support Him during His earthly ministry. In John 20, it was a woman who first saw Jesus at the tomb. The resurrected Christ told Mary Magdalene to go and tell the Apostles He had risen. Even in the delivery of the good news of Christ’s resurrection, a woman took the lead role under the authorization of Christ. God values women and He wants them to prioritize their homes, use their gifts in the church, and to impact society. What truth about the importance or role of women from this week’s sermon was new to you? Is there any part of today’s sermon that was difficult to understand or accept? As we learned above, women are formed in God’s image and expected to have dominion over the earth. Therefore, women should be considered equal in value yet distinctly different in function. The concept of equality in substance and distinction of roles is modeled for us by Christ Himself. In Colossians 1:15-16, we learn that Jesus Christ is the “image of the invisible God,” and that through Him all things are created. Although the Son is equal to God the Father, we learn in John 12:49-50 that God the Father’s function is to originate the plan for salvation and Jesus’ role is to carry it out. How does this understanding of the equality of substance yet the distinction of roles between God the Father and God the Son affect your understanding of the equality of substance yet distinction of roles between man and woman? It is no secret that this can be a controversial topic in the church. However, when our ideas are confronted with the truth of God, it is our responsibility to adjust to the truth rather than force Scripture to adjust to our idea. Based on the passages discussed above, are you willing to accept this biblical principal of womanhood, particularly concerning ministry? What adjustment must you make in your own life to align your thoughts with God’s Word? 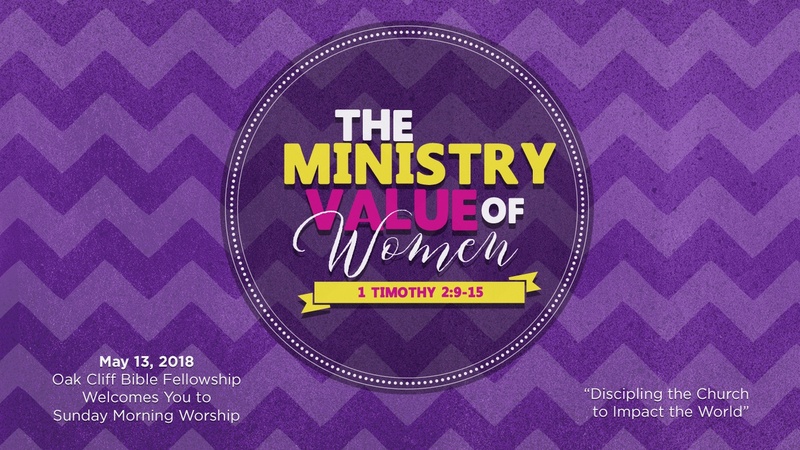 According to this message women can fully operate in any gifting within the church while operating under the legitimate authority of Church leadership. If you are a woman, are you fully operating in your gifts? Have you allowed misconceptions about women in ministry to stifle your God given purpose? If you are a man, have you valued women as assets for the Kingdom just as Jesus did in the Gospels? What can you do to encourage your sisters in Christ? God’s Kingdom mission on earth cannot be maximized without both male and female voices that add unique color to God’s picture. This week take some time to seek out sound teaching from the opposite gender. You can access sound teaching through a church approved resource by viewing the Right Now Media materials found under “Resources” on the church website. Take note of what unique perspective the teacher brings based on his or her gender. Do you know of someone who will be struggling this Mother’s Day because their mother is no longer living, or they are struggling with infant loss or infertility? What can you do to minister or encourage this person today?